This Elvis Presley biography Elvis In The 21st Century page is dedicated to providing quality Elvis Presley biography information, pictures and articles for your entertainment. The contents of this Elvis Presley site is written by a fan for his fans about Elvis In The 21st Century. Elvis 30 #1 Hits, 2003. Interest in Presley's recordings returned during the buildup to the 2002 World Cup, when Nike used a Junkie XL remixed version of his "A Little Less Conversation" (credited as Elvis Vs JXL) as the background music to a series of TV commercials featuring international soccer stars. The remix hit Number 1 in over 20 countries, including the United Kingdom and Australia (it was also his first top 10 hit in the UK for nearly 22 years, and his first #1 there for nearly 25 years). It topped Billboard's Hot Singles Sales chart (physical singles — legal downloads were not around at the time) but only reached #50 on the Hot 100. 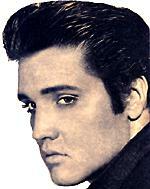 At about the same time, a compilation of Presley's US Number 1 hits, ELV1S: 30 #1 Hits, was being prepared for release. "A Little Less Conversation" (remix version) was quickly added as the album's 31st track just before its release in October 2002. Nearly 50 years after Presley made his first hit record and 25 years after his death, ELV1S: 30 #1 Hits reached number 1 on the charts in the US, the UK, Australia and many other countries. A re-release from the album, "Burning Love" (not a remix) also made the Australian top 40 later in the year. In December 2004 Wade Jones from Belmont, NC sold 3 tablespoons of water from a cup that Elvis Presley drank out of on eBay. The water fetched $455 Saturday (Dec. 25) on the auction site.One week later (January 2005), he sold an appearance of the Elvis Cup on eBay for $3,000.00 and currently tours with the Elvis Cup, which even has its own song "The Elvis Cup"..written and recorded by a Filipino Elvis impersonator, "Renelvis". Jones says he scored the styrofoam cup at a 1977 concert the King played. Hoping for a better souvenir, he ended up getting a cup out of which he saw Presley drink. In early 2005 in the United Kingdom, RCA began to re-issue his 18 UK #1 singles as CD-singles in the order they were originally released, one of them a week. The first of these re-issues, "All Shook Up", was ineligible due to its being sold together with a collector's box which holds all 18 singles in it (it actually sold enough to be #2). The second, "Jailhouse Rock", was the number one in the first chart of 2005, and "One Night"/"I Got Stung", the third in the series, replaced it on the January 16 chart (and thus becoming the 1000th UK number one entry). All of these have reached top 5 in the official charts, with three number 1s, eight number 2s, four number 3s, one number 4, and one number 5. These re-releases have made Elvis the only artist so far to spend at least 1000 weeks in the British top 40. CBS recently aired a TV miniseries, Elvis starring Irish actor Jonathan Rhys-Meyers as Presley. In July of 2005, Presley was named one of the top 100 "Greatest Americans," following a vote organized by Discovery Channel. In the vote, Presley ranked ahead of all entertainers and in 8th place behind Presidents Ronald Reagan, Abraham Lincoln, George Washington, Bill Clinton, and George W. Bush, plus Martin Luther King Jr. and Benjamin Franklin. A week later, Forbes magazine named Elvis Presley, for the fifth straight year, the top-earning dead celebrity, grossing US$45 million for the Elvis Presley Estate during the period from October of 2004, to October 2005. Forbes pointed out that Robert Sillerman's CKX company shelled out $100 million in cash, and stock, for an 85% interest in Presley's income stream in February 2005. Shortly after taking over the management of all things Elvis from the Elvis Presley Estate (which retained a 15% stake in the new company, while keeping Graceland and the bulk of the possessions found therein), Sillerman promptly shook things up by producing a more personal DVD and CD featuring Presley (and appropriately titled "Elvis by the Presleys"), as well as the accompanying two-hour documentary broadcast on Viacom's CBS Network, which alone generated $5.5 million. And while some of Presley's fans fretted that outside management might mar the appeal of Graceland, revenue is up at the Memphis shrine, too. On 9 December, 2005, the Book of British Hit Singles & Albums unveiled their annual list of the Top 100 Most Successful Acts of all time, based on the total number of weeks each recording artist has spent on the official UK Singles and Albums charts. Elvis Presley ranked #1, with Cliff Richard, Queen, The Beatles and Madonna rounding out the top 5. In the UK singles charts, Elvis went to # 1 the most times (21, three of them hitting #1 twice), spent the most weeks there (80), as well as had the most top tens and top forty hits. In the UK album charts, he is second to the Beatles (21), with 16 chart toppers, as well as earning the most top ten, and top forty albums. Still in the album category, his longevity record boasts an almost fifty year gap between his first, and last hit album. In total, he has spent 2,574 weeks in both the UK singles and album charts, way ahead of his closest competitors, namely Cliff Richard (1,982), Queen (1,755), the Beatles (1,749), and Madonna (1,660). A channel on the Sirius Satellite Radio subscriber service is devoted to the life and music of Elvis, with all broadcasts originating from Graceland in Memphis, Tennessee. In late March 2006, US Secretary of the Interior Gale Norton declared Graceland, Elvis' beloved home, a national landmark.